A couple with five children was recently blessed with a set of triplets. The couple, now with eight kids – five boys and three girls – never envisaged going that far in child bearing. But since circumstance had made it so, Mr. & Mrs. Ifeani Benjamin Amadu, from Ukpo in Dunukofia Local Government Area of Anambra State, have no option but to accept their fate.Mrs. Amadu told our correspondent that three months into her pregnancy, she had gone for scan only to be told that she was carrying three babies in her womb, a revelation that threw her into fright. Soon after she was delivered of the babies at Ajeromi General Hospital, Ajegunle, Lagos, on Saturday, October 27, 2014, the woman and her husband found themselves in a tight corner. 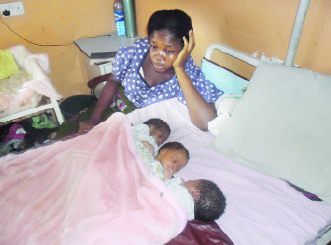 They had no money to offset their hospital bills, which stood at N150, 000. She told Daily Sun, however, that all the problems disappeared immediately after she was delivered of the babies. People kept trooping to the hospital to see the bundles of joy. It was discovered that the triplets were the first to be delivered in the hospital this year. Though she had a safe delivery and her triplets were in sound health, paying her hospital bills and taking care of the triplets have become a daunting task. Following failure of the couple to foot their hospital bill more than two weeks after delivery, the triplets and their mother could not be discharged. Mrs. Amadu wants financial support from men and women of goodwill who she believes would have a share in the special blessings being brought by the triplets. “At the moment, we cannot pay the hospital bill due to our severe financial constraints. We are therefore calling on men and women of goodwill like Governors Wille Obiano, Rochas Okorocha, Babatunde Raji Fashola, corporate bodies and other groups and individuals to come to our aid so that we can leave the hospital. I am tired of staying here; I want to go home with my babies,” she said. He believed that the triplets would serve as a point of contact for others. He described the situation, as a serious one and called on Nigerians to come to the rescue of his family. “I have been thinking about how to get out of this situation. My wife and the triplets have spent close to three weeks in the hospital because I have no money to pay their bill. I am appealing to those who are touched by what my family is going through to assist us financially so that we could pay the hospital bill and cater for the babies too. Any financial assistance should be made to Mr. Ifeani Benjamin Amadu, UBA Account number 2032569487. The family can be reached on 07033284662 and 09035639764.